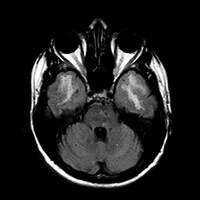 A 58-year-old woman with a long-standing history of migraines presented to the emergency department (ED) with an intractable migraine headache. She reported an incidence of at least one severe headache per month; however, in the preceding few weeks, they had become more frequent. In the ED, she was given a combination of valproate, ondansetron, and IV hydromorphone and dexamethasone. Ocasionally, she experienced numbness and tingling involving the right side of her face and right upper extremity. One of her most severe migraine attacks culminated with a brief episode of aphasia. Although she denied having any “strokes” in the past, she admitted having been sent to a rehabilitation facility for weakness and gait instability. Her father, paternal uncle, and grandfather all suffered from repeated strokes. The patient’s daughter recently reported the onset of fairly regular migraine headaches. Noncontrast CT of the head demonstrated hypoattenuation within the periventricular and subcortical white matter (WM) (Figure 1A). A scan through the middle cranial fossa revealed the presence of profound bilateral hypoattenuation of the anteroinferior temporal lobe WM (Figure 1B). Both T2 and fluid-attenuated inversion recovery (FLAIR) sequences confirmed the presence of extensive WM disease. An axial image through the level of the lateral ventricles demonstrated bilateral periventricular and subcortical WM disease involving the frontal and parietal lobes (Figure 2A). Caudally, symmetric involvement of the anteroinferior temporal lobe WM was clearly delineated (Figures 2B and 3B). An MR image at the level of the basal ganglia demonstrated the presence of FLAIR hyperintensity within the external capsules (Figure 3A). There was no evidence of abnormal restricted diffusion or enhancement after the administration of IV gadolinium. 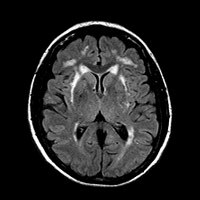 In daily practice, periventricular WM disease is fairly common. In the elderly, we are often quick to assign a diagnosis of small vessel disease or chronic microvascular change if the diffusion-weighted images are negative for acute/subacute infarction. Typically, older patients have a history of hypertension and/or clinically silent strokes. In younger patients, however, the presence and distribution of WM lesions warrants a more thorough analysis. History and neurological exam are fundamental to understanding the radiological findings and vice versa. MR imaging is exquisitely sensitive to detecting abnormalities within WM. The initial step in deriving a useful differential requires appreciating the broad categories of WM disease: demyelinating, viral, vascular, metabolic, toxic, traumatic, and dysmyelinating processes. With respect to the case herein, we are concerned primarily with the vascular category. For all intents and purposes, the main disease entities that fall under vascular phenomenon include small vessel disease (including sporadic subcortical arteriosclerotic encephalopathy), anoxic brain injury, reversible leukoencephalopathy, migraine, and CADASIL. Clinical history, including family history, is critical for establishing a diagnosis. In the literature, there are dramatic examples of familial involvement. 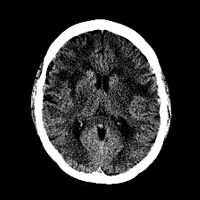 Utku et al described the incidence of CADASIL in a Turkish family, in which 12 individuals across four generations were affected, all manifesting with recurrent strokes. A mutation analysis identified the R90C mutation, which affects the N-terminal segment of the NOTCH3 gene.3 Various mutations have been identified, giving rise to a battery of molecular screening tests that can provide additional diagnostic certainty of CADASIL. It is worth mentioning that MR imaging in the setting of classic migraine headaches (far more common) is very different from that of CADASIL, though symptoms may overlap. Scattered, punctate foci of T2/FLAIR hyperintensity are often appreciated within the subcortical WM of the frontal and parietal lobes in the setting of isolated migraine phenomena. Figure 1A — CT of the head demonstrates hypoattenuation in the periventricular and subcortical white matter. Figure 1B — CT scan through the middle cranial fossa reveals the presence of profound bilateral hypoattenuation of the anteroinferior temporal lobe. 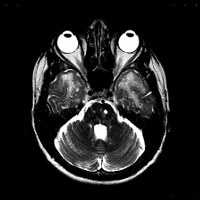 Figure 2A — A T2WI axial image through the level of the lateral ventricles demonstrates bilateral periventricular and subcortical WM disease involving the frontal and parietal lobes. Figure 2B — Caudally, MR image symmetric involvement of the anteroinferior temporal lobe WM is clearly delineated. Figure 3A — An MR image at the level of the basal ganglia demonstrates the presence of FLAIR hyperintensity within the external capsules. Figure 3B — Caudally, MR image symmetric involvement of the anteroinferior temporal lobe WM is clearly delineated. Yousem DM, Grossman RI. 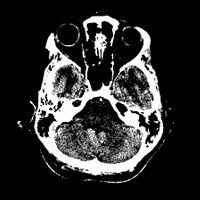 Neuroradiology: The Requisites. 3rd ed. Philadelphia: Mosby; 2010: 238-239. Kalimo H, Ruchoux MM, Viitanen M, Kalaria RN. 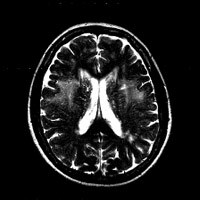 CADASIL: A common form of hereditary arteriopathy causing brain infarcts and dementia. Brain Pathol. 2002;12(3):371-384. Utku U, Celik Y, Uyguner O, et al. CADASIL syndrome in a large Turkish kindred caused by the R90C mutation in the Notch3 receptor. Eur J Neurol. 2002;9(1):23-28.